Transfer via: flight - your arrangement. Upon your arrival at Chongqing Jiangbei International Airport, our local guide will hold a sign of our logo "Zhangjiajie Tour Guide + last name" to meet you at the arrival hall of the airport. After hotel breakfast, drive to visit some famous places like the Monument to the people's Liberation, Hongya Cave, Ciqikou Old Town, Chongqing People's Auditorium, and Chongqing People's Square. We will take the Yangtze River Cableway and Chongqing Rail Transit (Light Rail) to enjoy the cityscape of Chongqing. 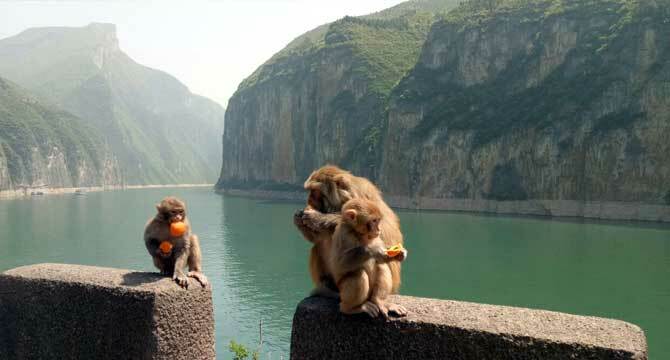 Today, enjoy an interesting shore excursion to the mysterious Fengdu Ghost City. Your breakfast and lunch will be buffet, and dinner will be the Chinese dinner on the cruise. Upon arrival at Zhangjiajie train station, our Zhangjiajie tour guide will hold a sign of our logo "Zhangjiajie Tour Guide + last name" to meet you at the exit of the train station. Drive to your hotel check in. After hotel breakfast, walk about 150 meters to Zhangjiajie Nnational Forest Park (no car and driver for today). You will ascend Yuanjiajie Mountain by the famous Bailong Elevator. On the summit, you will take about 2.5 hours hiking to admire the Southern Sky Column (had been officially renamed "Avatar Hallelujah Mountain"). Proceed to the Fascinate Platform to enjoy the nearby breathtaking peak views and then walk across the No. 1 Bridge under Heaven. Climb up the Tianzi Mountain to enjoy breathtaking views. Later, take the cable car down the mountain to have a walk (40 minutes) along the dreamlike fairyland –Ten-mile Natural Gallery (mini-train is optional, RMB 76/pp for round trip). After hotel breakfast, drive to explore the attractive Zhangjiajie Grand Canyon, which is known as the landform museum of Zhangjiajie. One of the highlights in your canyon exploration is a challenging walk on the most terrifying glass bridge in the world - Zhangjiajie Grand Canyon Glass Bridge. Afternoon, move on to visit Tianmen Mountain National Forest Park, where you will experience a ride on the world’s longest cable car up to the summit of the Tianmen Mountain. You will take a hiking (approximately 2 hours) on the Plank Road along the Ghost Valley (including glass walkway). After hiking, you will pay a visit to the Tianmen Temple, and then take the sightseeing cable car and back to the Tianmen Cable Car Station, and take the big cable car down to the middle station, you will take a bus via the Heaven-Linking Avenue to see the world famous Tianmen Cave. Drop off at Zhangjiajie Hehua International Airport.